Deadlines Pro always keeps your tasks ordered from the most urgent to the least urgent, thus overdue, due today and upcoming deadlines will always stay at the top, while less urgent or completed ones will stay at the bottom. The box at the left of each entry is labeled with the number of days remaining to complete the deadline and colored in accordance with its urgency: simply tap on the box to check it and mark the deadline as completed. You can clear all completed items at once by tapping on the “trash checked” icon. Skipping holidays is as simple as selecting a calendar with holidays, thus the computation can be easily customized with your own holidays. Deadlines Pro also provides a built-in browser that is optimized for subscribing to holiday calendars from The Mozilla Foundation Holiday Calendars Directory or every other iCal calendar available across the Web. Skipping holidays requires iOS 5.0 or later. Tap on a deadline to access its details and fix or compute the deadline date specifying a start date and the number of days to deadline. Deadlines Pro allows you to automatically shift the start date of the computation to the end of the month (very useful for invoices) and skip specific days of the week or holidays. You can also review the computation and see every single day that was skipped, along with the reason why it was skipped, with the ability of turning off the skip of a specific day, regardless of the skip rule previously set up. Use the “bell” icon on the right of each deadline to create a linked calendar event with an alarm, thus you can be alerted about the deadline even if the app is not opened and also when you are using any other device sharing the same calendar. When a deadline is linked to a calendar event, its bell icon is highlighted and every change to the deadline will be pushed to the linked calendar event (unless you turn off the corresponding option in the settings). You can also tap on the highlighted bell icon to modify the event manually. The app also includes a handy built-in calendar widget that you can use for reference, which can be shown or hidden as needed using the “calendar” icon. 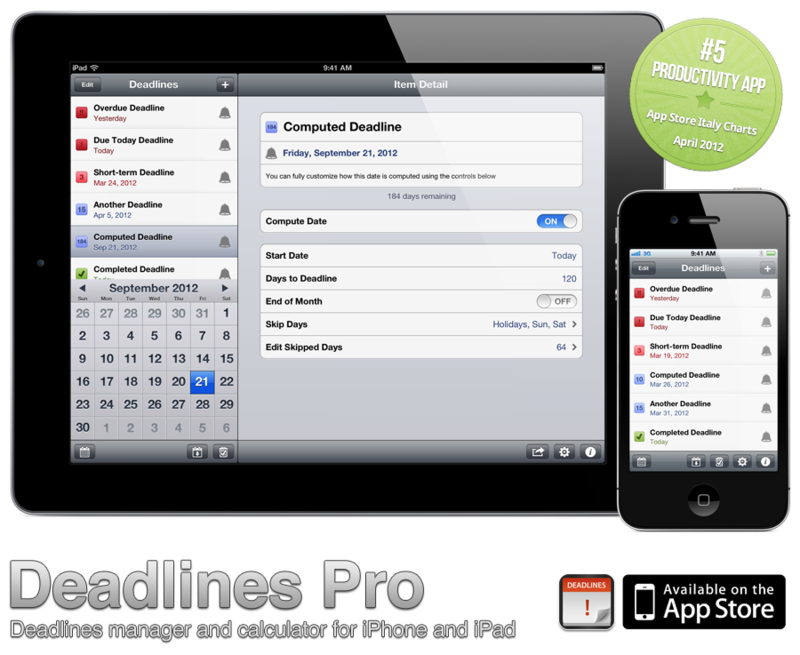 Deadlines Pro is a Universal App that runs on iPhone, iPod Touch and iPad. This means that you can buy the app once and use it on every kind of device you own. If you used to keep track of your deadlines using a calendar on the device, you can quickly import all of its events and create corresponding deadlines tapping on the “calendar with arrow” icon. Deadlines imported from your calendars are automatically linked with the corresponding calendar events, thus you can reimport the calendar at a later time to add new deadlines without duplicating existing ones.